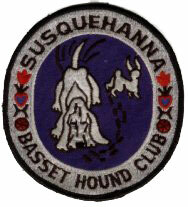 The Susquehanna Basset Hound Club is licensed by the American Kennel Club and a member of the Basset Hound Club of America. ✯ Founded to encourage and promote quality in the breeding of pure-bred Basset Hounds, and to do all possible to bring their natural qualities to perfection. ✯ To urge members and breeders to accept the Standard of the Breed , as approved by the American Kennel Club, as the only standard of excellence by which Basset Hounds should be judged.